It sometimes feels like there are two options for breakfast: sugary, sweet pastries or eggs and bacon. The truth is, you don’t need to choose between a meat-based breakfast and low-sugar, protein-rich meals. Cooking with legumes and beans is a great way to get protein into your breakfast and “beef up” the content of your first meal without having to include animal products. Beans and legumes for breakfast?! Yep! Here are five plant-based ideas to inspire your next breakfast creation. A vegan-friendly breakfast polenta can be a hearty and filling way to start the day. Add some beans (all types taste good, especially kidney beans with a hint of maple syrup) and you have a protein-packed breakfast that’ll keep your energy levels high all day long. Two of my favorite recipes come from The Breakfast Drama Queen and The Stingy Vegan. Just add your favorite beans to their veggie toppings and you’ll be good to go. Vegan breakfast skillets are delicious, but without adding in beans or tofu, they are high in carbs and fat but lack protein. Beans and legumes do the trick! I love these two scramble recipes from Heather Christo and Veg News. Breakfast bowls are always a great option, mainly because they frequently contain tons of healthy whole grains and veggies. 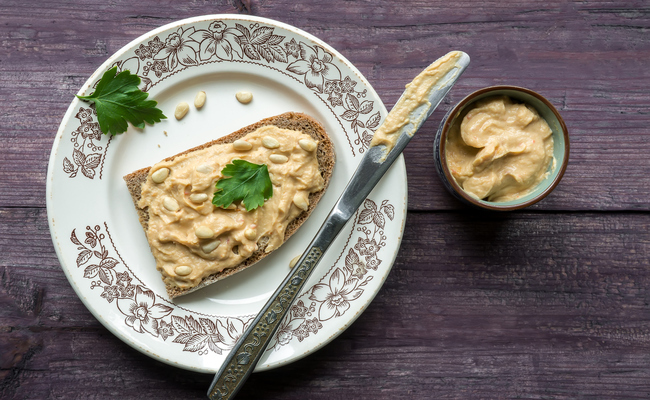 Adding a few dollops of hummus to your breakfast bowl boosts your meal’s protein and healthy fat content, making it even more nutritious. If you’re not vegan, adding an egg on top is often the icing on the cake, but feel free to keep it egg-free by adding hummus, vegetables, avocados and chia seeds. Oatmeal is often sweetened with fruit or maple syrup, but instead of going the sugary route, why not whip up a delicious savory oatmeal bowl? Filling and uber-tasty, these dishes are great for vegan breakfasters. I particularly love this recipe for Oatmeal With Mushrooms, Onions, Chickpeas and Greens from The Lovely Crazy, as well Savory Turmeric Chickpea Oats from The Full Helping. Finally, lentils make for an amazing addition to just about any meal. Their light flavor and nutritious profile make them a great topping for toast (including avocado toast) or breakfast bowls. Try out these Breakfast Lentils from Meatless Monday or this Kale Lentil Breakfast Bowl from Lively Table. Thanks, but I'll stick with an ETHICAL OMNIVORE breakfast of foods from my farm. I may start my day with baked beans (homemade) on toast.